The experienced, well-grounded team at Diamond Landscapes & Athletic Fields offers a turnkey operation for your new landscaping design and installation project. 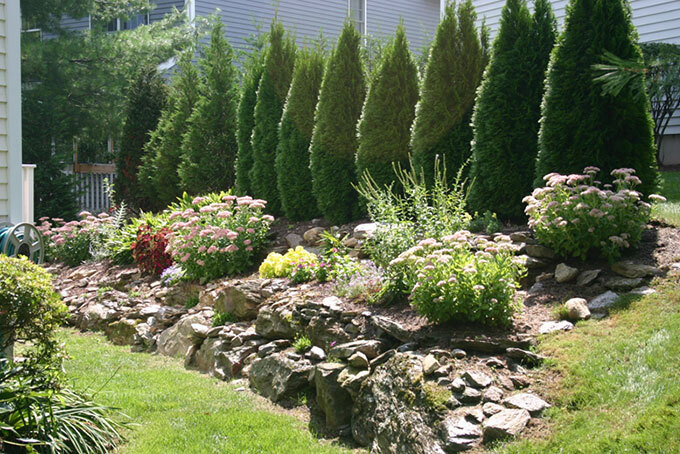 We’re the landscaping design company of choice for many Connecticut homeowners and businesses, because we are both landscape designers and certified contractors as well. You can rest easy knowing that we are insured, bonded and licensed by the state of Connecticut. Among our specialties is the design and installation of outdoor environments. No job is too big or too small for our team, whether it’s installing retaining walls, terraces, driveways, walkways, lawns, irrigation systems, or annual and container plantings. Additionally, we provide much in-demand services like edging, mulching and weeding of planting beds and weekly lawn-mowing services. Read more about our residential maintenance services. Our prices are competitive and our daily mission is not only to meet but to exceed your expectations. Naturally, there are a number of critical steps in the design and implementation of a landscape project, no matter the scope. To us, the most important step is the initial consultation between designer and client. For any landscape project to be successful, it must reflect a well-thought-out interpretation of expectations. Also critical is a free exchange of ideas, balanced by practical site and budgetary considerations. Ongoing collaboration and excellent communication between both parties remain key. Drawing on our deep knowledge of landscape design, we will get your project off the ground by thoroughly evaluating your property and then discussing your vision. Then we will get to work on crafting detailed schematics to show you how we intend to carry out what you have visualized. We have decades of creative and technical experience to help bring your landscape ideas to life! Count on us to handle the entire process, from your first thoughts and expectations all the way through project completion. Give Diamond Landscapes & Athletic Fields a call or send us an email. We would be happy to meet with you to discuss ideas about your new landscaping design or installation project.